There’s just something about gathering together with friends and family for the big game … and eating super tasty, often salty and cheesy foods. It just feels right! But what if you are trying to eat healthier this year? No problem! There is no need to cut yourself short during the big game! All of these recipes are super bowl party worthy and packed with tons of flavor. 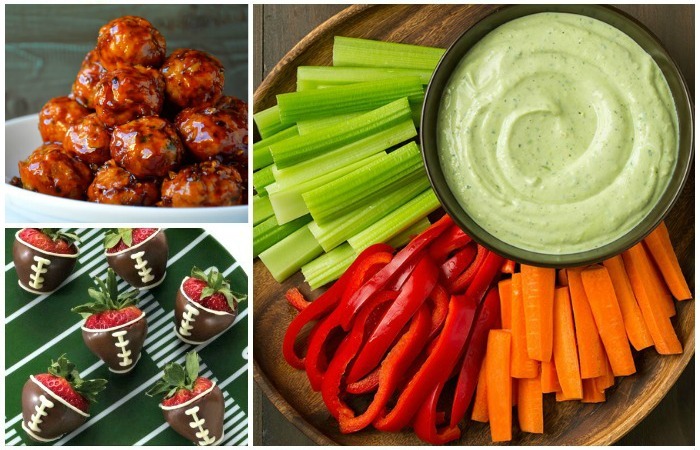 Make these super bowl appetizers and munchies for your next game day to satisfy your taste buds without veering too far off your healthy eating path. 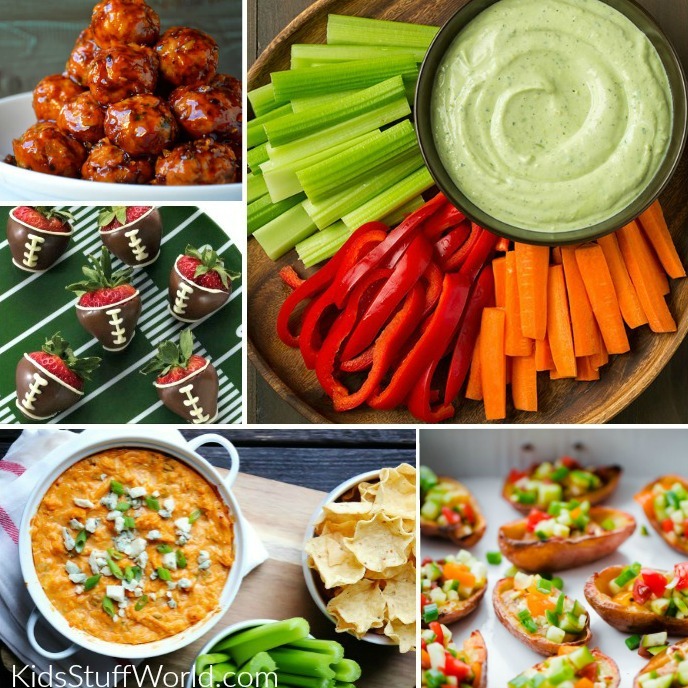 Making simple swaps like replacing sour cream with Greek yogurt, baking instead of frying, using ground chicken or turkey instead of beef, etc can help you cut some serious calories and reduce the amount of fat in all your favorite super bowl appetizers and game day foods. Southwest Loaded Potato Skins: Load these potatoes up with corn, bell peppers, beans, and bacon. These are snacks that will fill you up fast! Plus, they are super easy to make. Avocado Greek Yogurt Ranch Dip: When football is on, dip is mandatory! By using Greek yogurt, and veggies instead of chips, this all time favorite football snack turns into a healthy, light, and savory side. Skinny Buffalo Chicken Dip: You can also use Greek yogurt as a substitute in warm dip recipes. This one is the perfect example. The best part? You cannot tell the difference in the ingredient swap! Baked Pickle Chips: Yes, you can bake pickles. And they are incredibly delicious! Greek Style Potato Skins with Hummus: A gluten-free and vegetarian twist on a game day classic, these crispy potato skins are filled with hummus, chopped cucumbers, tomatoes, olives and feta making them an unusual, but healthy twist for your next football party. Gluten Free Buffalo Chicken Nuggets: You can get your chicken wing fix by making these baked gluten-free buffalo chicken nuggets instead. The only thing you’ll be missing are the calories! Buffalo Cauliflower Bites: Forget the chicken wings, try these cauliflower florets smothered in homemade buffalo sauce and served with a cooling ranch yogurt dip to help put out their fiery blaze. Oven Baked Truffle Fries: Here comes another crowd pleaser, french fries. These fries are baked, not fried and have a gourmet twist thanks to a sprinkling of truffle salt and truffle oil — yum! Baked orange chicken meatballs: The flavor in these is like an explosion in your mouth. I love how she used a muffin tin to make these! Serve with toothpicks to help make cleanup a breeze. Paleo Nachos with Sweet Potato Chips: It is possible to eat a lighter version of nachos. The trick? Load them with healthy veggies and lots of protein (make it even lighter by subbing ground turkey here) and try eating them on oven baked sweet potatoes. Yes they will get crunchy if you bake them long enough, the result is both filling and fantastic! oh yeah, and don’t forget dessert! Chocolate Covered Strawberry Footballs: These chocolate dipped strawberries are the perfect thing! Use a dark chocolate for an even healthier version. 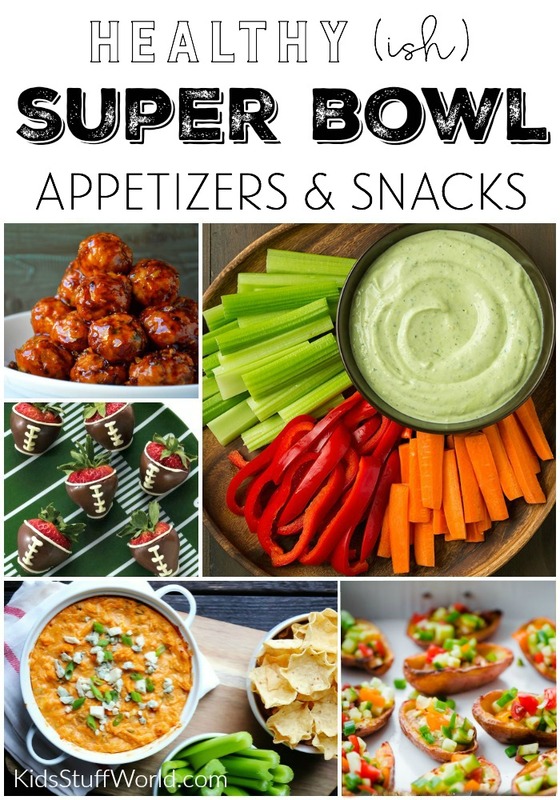 I hope our list of lighter super bowl appetizers and snacks will give you some ideas. What tips, tricks and recipes do you rely on to stay on track during the game? Not as worried about healthy treats? Check out our third quarter brownie bites, a family game day tradition.